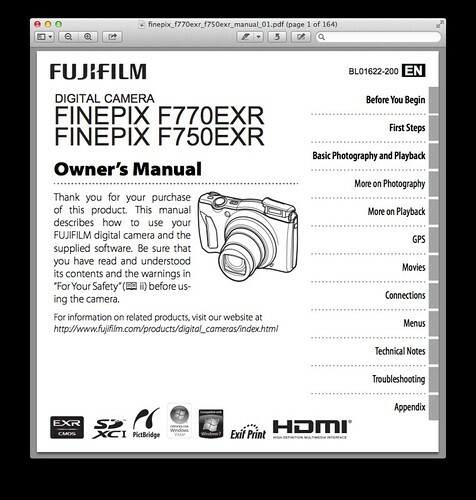 The official user guide for the Fuji F770 EXR is a 164-page, 2.46 MB PDF document titled “Fujifilm FinePix F770EXR Digital Camera Owner’s Manual”. Go here if the download link provided above didn’t work for you. Normal mode: Approx. 45 cm (1.4 ft.)–∞ (wide angle); 2.5 m (8.28 ft.)–∞ (telephoto). Macro mode: Approx. 5 cm–3 m/1.9 in.–9.8 ft. (wide angle); 1.3 m–3.0 m/4.2ft.–9.8 ft. (telephoto). AC power adapter AC-5VX and DC coupler CP-50 — these connect the camera to an electrical outlet for extended use. Digital viewer FINEPIX REAL 3D V3 allows you to view 3D images without 3D glasses.